Start with our Honey-Spiced Cedar Plank Chicken recipe if you're new to cedar plank grilling. 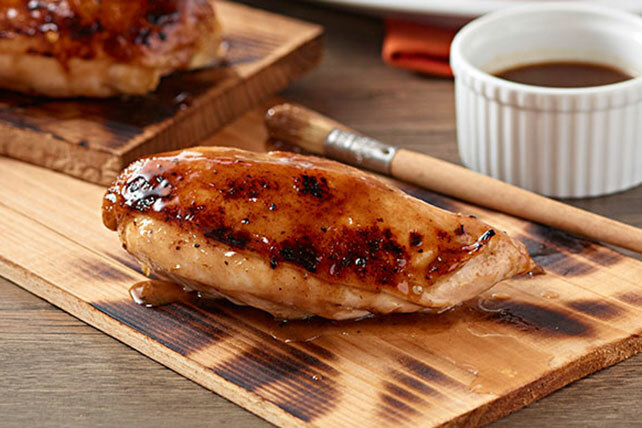 Cedar plank chicken is simple and has an unmistakable taste. Immerse cedar planks in water, placing weight on top of each plank to keep it submerged. Soak 4 hours. Heat grill to medium heat. Remove planks from water; brush tops of planks with oil. Place 2 chicken breasts on each plank. Place on grate of grill; cover with lid. Grill 30 min. Meanwhile, mix remaining ingredients until blended. Reserve 1/2 cup dressing mixture to serve with the cooked chicken. Brush chicken evenly with half the remaining dressing mixture. Grill 30 to 45 min. or until chicken is done (165ºF), brushing occasionally with remaining dressing mixture. Remove chicken from grill; discard planks. Remove and discard bones from chicken. Cut each breast in half. Serve with the reserved dressing mixture. UNTREATED cedar planks, which are sold for this purpose, can be found at most specialty food stores or some grocery or hardware stores. During cooking, check periodically to make sure that the planks are not on fire. Since the planks can ignite when exposed to flames, it is best to keep a spray bottle of water close at hand if needed to extinguish any flames. Serve with a tomato, cucumber and onion salad. Prepare recipe as directed, using a quartered 4-lb. chicken. Place 2 chicken quarters on each oiled soaked plank. Grill 1 to 1-1/4 hours or until chicken is done (165ºF). The cedar planks can be soaked up to 24 hours before using as directed.